Haunted House, a photo by Fergiemoto on Flickr. Click on photo to enlarge. Does this look spooky to you, even without seeing any of its residents? 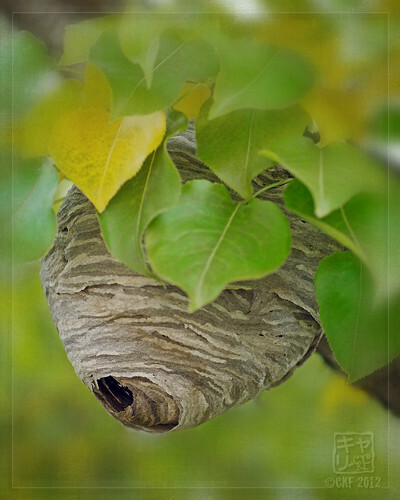 This nest is a residence for the Bald Faced Hornet and was in my mother’s yard in her large Asian Pear tree. It was about 3-feet off the ground and larger than a football in diameter. When she told me about it last week while I was visiting her, curiosity motivated me to have a quick look and snap a couple of photos. However, fear of having a painfully potent encounter with lots of small black spooky-looking things drove me away very quickly. I have been stung before by yellowjackets and bees, and I’ve stepped on a bumble bee nest by accident – big owwwwwie for several days!! So I decided to use Wikipedia’s photo below so you can see what the little critter looks like up close. It belongs to a genus of wasps in North America called yellowjackets, but called a hornet because it builds paper nests. It is not a true hornet. Their scary costumes and face masks are permanent! This is for the letter “R” Story Challenge by Frizztext, to share a short story or reflection, even an aphorism using a word tagged with each letter of the alphabet. This entry was posted in Uncategorized and tagged A-Z Archive, art, autumn, bees, haiku, insect, macro, nature, nests, photography, photos, poems, poetry. Bookmark the permalink. It’s November, I guess the residents has almost all gone. = you can cut open the nest if you like. How odd – I went out onto the front lawn this afternoon and found your haunted house’s mate empty and blown open by Hurricane Sandy! I wonder where the wasps are? It is scary, but this photo is amazing! Love the DOF. What a creative idea and title for a blog post! I had no idea about Bald Faced Hornets and certainly didn’t know they could be so interesting! This is great! You were brave to approach the nest at all. When I went near a bee nest at the back of my apartment block car pack, I got stung on the cheek and that was bad enough. By the sound of those hornets, they are really nasty little insects. I only stayed for a few seconds, just enough to get a couple of shots. But for you, big owwie right on the cheek! I bet that swelled and hurt for a while. scary costumes and face masks! But the information is interesting. You always come up with the most unique things to photograph. To often I forget about the smaller world but with your photos it brings me back down to earth. Thank you for all your nice comments and likes. I have worked around Bald Faced Hornets my entire career. When provoked they will strike like a bullet. Given the chance they’ll sting a person between the eyes. I’ve seen them knock a big, brawny timber faller right off a log. They are mean, nasty little creatures that definitely need to be avoided. Great picture. What a fascinatingly beautiful haunted house . . . since I nearly lost a dearly beloved to a wasp sting have always had a healthy respect for the species, beautiful homes or not!! Shiver – beautiful shot but so scary too! I guess you had a zoom lens on but even so it sounds scary. Amazing nest though! Wise choice! I’m allergic to many insects and I have to carry an epi pen. When I went to Africa, my doctor made me bring 5. And I didn’t use one of them. I haven’t yet and I hope I don’t ever. Beautiful! The photo is beautiful and so is the wasp or hornet house. Imagine how much work it has taken the hornets to built it with a mixture of spit and plant fibre. fascinating and a little terrifying, too. your photo is just lovely though. funny how scary stuff can BE so BEautiful, too. The residence looks really nice… well, having said that, I wouldn’t try looking in!!!! I don’t think I’d like an encounter with the resident!!! It certainly looks potentially menacing! A nice take on the Halloween theme. The nest is an amazingly beautiful structure. I’m not so fond of these creatures though. And not much of a friend to the honeybee, I suspect. I remember yellow jackets when I was growing up in the States. Here, in southern England, the wasp is a bit more sedate but still a predator of bees…. Great post! That is one scary looking face on that critter! Wonderfully spooky post for Halloween…so creative! Yikes! The nest kind of reminds me of a mummy. Scarey inhabitants but wonderful abode! As always, love your photo and haiku. You were very brave! Super nest, a work of art. I just ignore the spooky creatures and look at your photo, you are a brave one !